Looking for paid employment that makes a difference to our planet and the health of our community? READ ON! Georgian Triangle Earth Days Celebrations is a charitable organization dedicated to energy conservation strategies and climate change mitigation approaches. It starts with science based education and moves as quickly as possible towards action in solving problems for our Earth. GTEDC will be hiring 2 people under 30 and one coordinator to install clotheslines as an alternative energy project to help homeowners and apartment dwellers stop using clothes dryers that consume large amounts of natural gas or electricity. Here is how it works: a representative will first come to a home to see where the clothesline would be placed. They will have homeowners sign a contract agreeing to the long-term usage of the clothesline. This project will help families cut greenhouse gas emissions. Families also save $100 a year or reduce 6 to 10 percent of their electric bills by using clotheslines. In fact, if we got rid of all our electric/gas dryers we would reduce the emissions equal to145,000 cars in Ontario. That is why this work is so important. Since the goal is to dramatically lower emissions, bicycles will be ridden most days to the various sites. Work will start as early as May 1st. Some employment will run only for the summer but other work will continue to spring. This pilot project is only the first step in implementing many other low- cost but extremely effective projects. Youth can be the leaders in achieving successful change and be paid to do so! As engaged and informed persons on climate issues know, older adults need help in finding alternatives to an out-dated ‘growth-is-best’ consumer driven ethos. Many young people feel hopeless with regards to fighting climate change, but hope means rolling up your sleeves and turning good ideas into actions. Write to celebrateearth@yahoo.ca if you are a motivated young adult who wants to lead the way with meaningful actions and desires to work on this innovative team project. Tell us about yourself and when you are interested in working. Our corporate partner, Home Hardware in Thornbury, will reduce the cost of a clothesline package by 25 per cent to help make this a successful project. This project will go ahead in early July if public sector funding is also received. Recently EcoJustice and one of its lawyers, Albert Koehl, worked to make all municipalities in Ontario clotheslines-friendly, thus overturning bylaws that had previously prohibited them. GTEDC wants to celebrate their efforts by putting into action this Ontario law. Projects such as Clothesline Action need young adults to be in the vanguard because they know what is at stake and can inspire other people to make a huge difference. The United Nations is framing World Environment Day on June 5 as a day of action by saying, “Your Planet needs you: Unite to Combat Climate Change”. The host for this year’s Billion Tree Campaign is Mexico who promises to plant a quarter of these trees. This is also part of a campaign to highlight the urgency to act now and make the December climate negotiations in Copenhagen succeed in bringing about a post-Kyoto deal on drastically reducing greenhouse gas emissions. On May 30, Professor Thomas Homer-Dixon from University of Waterloo gave an impassioned talk in Collingwood on climate change. The two-hour talk and discussion started off with a picture of his young children. He believes that in the next twenty years his children will question him as to his role in stopping the collapse of the natural world and civilization. The talk was an exploration of how we can make our societies more resilient through renewable energy, changing our values and our willingness to fully embrace a conservation ethic. He backed up his cogent arguments with the latest scientific evidence that unequivocally flags the need to act aggressively to combat climate change. Thomas also says that we must find the courage to demand creative alternatives to the business-as-usual, rigid growth models that can’t continue without the destruction of a benign climate. “A value system that makes endless growth the primary source of our social stability and spiritual well-being will destroy us…Alternative values might… promote broader, fairer and more vigorous democracy”, he says in “Upside of Down” and in his lecture. Alternative values that celebrate Earth as opposed to conquering it, could support a steady state economy. Professor Homer-Dixon speaks of a power shift happening around the world that can bring huge suffering to humanity. There are two billion people who don’t make $2 a day and it is an explosive situation. “Dislocated lives, worsened poverty, and wider income gaps affect the motivation to participate in violence by providing fodder for extremist leaders.” Climate change will exacerbate the deep divide between groups and the disparity between rich and poor will widen. A ‘power shift’ will mean that there is a greater possibility for terrorism. Fortunately, there is another ‘power shift’ that is gaining ground; youth are leading the way. Canadian Youth Climate Coalition (See www.ourclimate.ca) will be having a three day (October 21-23) forum. They have decided to reach out towards the international Power Shift (See www.powershift2009.org) movement in the U.S., U.K. and Australia. All levels of Canadian government are asked to cut carbon dramatically and immediately, invest in a green economy, power our future with clean energy and not dirty fuels, and lead the world to a clean and equitable energy future. Their inaugural conference call last week brought together 40 people from across Canada, and it became abundantly clear that these bright and articulate youth can put together the workshops and strategy sessions culminating in a huge ‘lobby’ day on October 23. “We will deliver our message of change to our elected officials and push the federal government to take bold steps in tackling climate change.” Youth are embarrassed at seeing the Canadian government declared a “laggard” in not implementing, and in many cases blocking, international climate initiatives. World Environment Day is a sign post that directs us towards taking our planetary responsibilities seriously. It is one of many vital clarion calls to action. Please visit Ottawa this October 21-23 and unite with young people in their fervent wish for a safe future. They deserve your full commitment. Elizabeth May’s new book, “Global Warming for Dummies” describes biological diversity as “the planet’s variety of living species…from the deep forests of China, to the mountains of Canada, to the icy waters of Antarctica”. (Ms May apologized when she visited Collingwood on May 16 for the name “Dummies”. She explained that the “For Dummies” series of books uses a specific way to get to the heart of a particular subject, and her book is for people like you who are passionate about making a difference in stopping climate change.) Her book is a fantastic opportunity to bring you up to speed on climate change and related issues. You can get a copy from your library; discuss it with your friends and create an action plan to reconsider old 20th century models for success. Mahatma Gandhi deeply understood that happiness and well being had little to do with acquiring more things. You, the youth of the world, might want to learn more about this wonderful man, if you are going to be inspired to change the world’s growing obsession to convert the natural world into a parking lot for consumption. You may wish to ponder what the older generations have been selling you, including the all-in-one-save-the-world organic cloth shopping bag full of ‘green’ products signifying a bankrupt generation’s shop-to-you-drop answer to when huge doses of permafrost and livestock methane hit the bag of goodies. So please cozy up to Nature and take the bus, walk or cycle instead of accepting the hybrid car Dad or Mom wants to give you when you graduate. Start off your new independence with a visit to The Schad Gallery of Biodiversity at the Royal Ontario Museum which just opened on May 16 to celebrate the United Nation’s International Day for Biological Diversity. The Gallery looks at the diversity of life on earth and how species and habitats are threatened by human activity. Life Is Diverse, Life Is Interrelated and Life Is in Crisis are the three main areas of interest. www.rom.on.ca/schad/ On Friday, May 22, the Gallery looks at how humans can help stop Invasive species that have no natural predators in their adopted habitat. Take the train for the day from Barrie to Toronto to the museum. 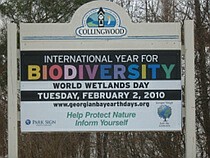 The event is called “Partners in Protection: Invasive Species”, 10 am – 3 pm. Speaking about being better informed, Professor Thomas Homer-Dixon comes to Collingwood on May 30. 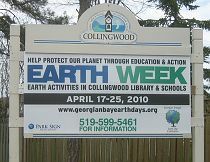 He is in Collingwood to talk about making intelligent choices for humanity and our planet. Check out a copy of his newly printed “Carbon Shift” or “The Upside of Down” to be ready for his talk-$5 for youth. Find out how unbridled growth causes balanced and resilient ecological systems to become unhinged and collapse. Now that you’re graduating, it’s your turn to take the helm and steer the ship, Earth, towards safety. Don’t wait till tomorrow. Humans are now changing our climate so rapidly that all of civilization is in the balance. Our Earth desperately needs you, the youth of our nation, to show leadership if our planet is to have a sustainable future. There is no time to wait for someone else to act. Please read the below suggestions; these are just a start. 1600 students attended our November 18/19 2008 Nature Festival. Thank you to Ontario Trillium Foundation. Our third International Day of Climate Action to be held during Copenhagen climate Change summit, December, 2009. Countries around the world search for solutions to stop the destruction of their forests and ecosystems habitats in order to save biodiversity, endangered species, and turn away from run-away greenhouse gas emissions. In the West we have been asked to put together action plans that balance our demand for wood, biofuel, and resource taking with the protection of huge areas of pristine forest. These plans have been the subject of intense scrutiny by the United Nations, International Union for the Conservation of Nature to the World Bank. Deforestation and farm community fragmentation are some of the main causes for an increase in greenhouse gas emissions; we must do more to see real financial value in undisturbed forests and other natural areas that encompass so much of the Earth’s biodiversity!